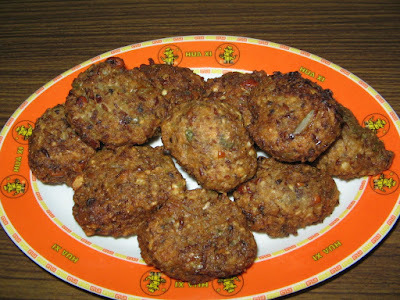 Before making vadas again wash them,and wet grind them in a mixie using less water. It should be grinded a bit coarsely. kothmeer,maidha and salt.Mix well and make a medium sized rounds,and press a bit in to the shape of vadas. Place a kadai and pour oil for deep frying,and when the oil is heated well,fry pakodas till brown.Place the hot pakodas on a tissue paper,then serve them hot. It can be made as a evening tiffin for children with tomato sauce. I experimented this in my kitchen and got it.